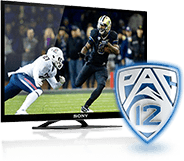 Sling TV offers all six Pac-12 Networks regional channels, giving its subscribers the ability to watch all six Pac-12 Networks regional channels via any device that Sling TV supports. Details from Sling TV can be found here at Sling.com. Sling TV does not currently offer subscribers the ability to log in and watch Pac-12 Networks content via the Pac-12 Now app or Pac-12.com.